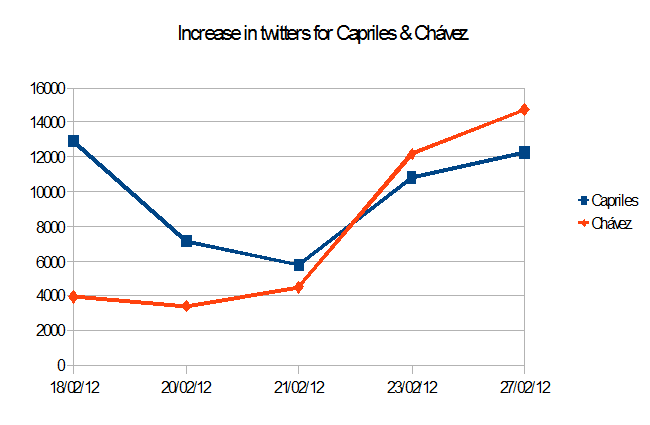 By analysing the following chart you can see how Chávez's disease can be "benefitial" to his campaign. Henrique Capriles, the newly selected candidate for the alternative forces, is hardly known outside Venezuela by anyone but those a priori interested in Venezuela. Chávez is known by most kids in Belarus or Russia. It is natural Capriles has fewer twitter followers (over 600 thousand) than the military caudillo (who has about 2.6 million followers). Still, in the last couple of weeks Capriles started to get more followers per day than Chávez...until the day when the latter announced yet again that he had "a lesion where his cancer was". Now Chávez is capitalizing on the pity effect, as Duquenal documented.